Background: Social media, defned as interactive Web applications, have been on the rise globally, particularly among adults. The objective of this study was to investigate the trend of the literature related to the most used social network worldwide (i.e. Facebook, Twitter, LinkedIn, Snapchat, and Instagram) in the feld of psychology. Specif‑ cally, this study will assess the growth in publications, citation analysis, international collaboration, author produc‑ tivity, emerging topics and the mapping of frequent terms in publications pertaining to social media in the feld of sychology. Methods: Publications related to social media in the feld of psychology published between 2004 and 2014 were obtained from the Web of Science. The records extracted were analysed for bibliometric characteristics such as the growth in publications, citation analysis, international collaboration, emerging topics and the mapping of frequent terms in publications pertaining to social media in the feld of psychology. VOSviewer v.1.6.5 was used to construct scientifc maps. Results: Overall, 959 publications were retrieved during the period between 2004 and 2015. The number of research publications in social media in the feld of psychology showed a steady upward growth. Publications from the USA accounted for 57.14% of the total publications and the highest h‑index (48).The most common document type was research articles (873; 91.03%). Over 99.06% of the publications were published in English. Computers in Human Behavior was the most prolifc journal. The University of Wisconsin–Madison ranked frst in terms of the total publica‑ tions (n = 39). A visualisation analysis showed that personality psychology, experimental psychology, psychological risk factors, and developmental psychology were continual concerns of the research. Conclusions: This is the frst study reporting the global trends in the research related to social media in the psychol‑ ogy feld. Based on the raw data from the Web of Science, publication characteristics such as quality and quantity were assessed using bibliometric techniques over 12 years. The USA and its institutions play a dominant role in this topic. The most preferred topics related to social media in psychology are personality psychology, experimental psy‑ chology, psychological risk factors, and developmental psychology. سابقه و هدف: رسانه های اجتماعی که به عنوان برنامه های کاربردی وب تعاملی تعریف شده اند، در سطح جهانی، به ویژه در بین بزرگسالان افزایش یافته است. هدف از این مطالعه بررسی روند ادبیات مربوط به شبکه اجتماعی مورد استفاده در سراسر جهان (یعنی فیس بوک، توییتر، LinkedIn، Snapchat و Instagram) در زمینه روانشناسی است. به طور خاص، این مطالعه رشد نشریات، تحلیل استناد، همکاری بین المللی، تولید مولف، مباحث ظهور و نقشه برداری از مضامین مکرر در نشریات مربوط به رسانه های اجتماعی در حوزه سیکولوژی را ارزیابی خواهد کرد. روش ها: انتشارات مربوط به رسانه های اجتماعی در حوزه روانشناسی منتشر شده بین سال های 2004 تا 2014 از وب علوم به دست آمد. پرونده های استخراج شده برای ویژگی های کتابشناختی مانند رشد در نشریات، تحلیل استناد، همکاری بین المللی، مباحث ظهور و نقشه برداری از مباحث مکرر در نشریات مربوط به رسانه های اجتماعی در روستای روانشناسی مورد تجزیه و تحلیل قرار گرفته است. 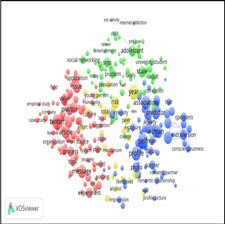 VOSviewer v.1.6.5 برای ساخت نقشه scientifc استفاده شد. يافته ها: در مجموع، 959 مقاله در طول دوره سالهاي 2004 تا 2015 بازيابي شده است. تعداد انتشارات پژوهشي در رسانه هاي اجتماعي در روان شناختي رشد رو به بالايي داشته است. انتشارات ایالات متحده از 57.14٪ کل نشریات و بالاترین h-index (48) بوده است. شایع ترین نوع سند، مقالات پژوهشی (873، 91.03٪) بود. بیش از 99.06٪ از این نشریات به زبان انگلیسی منتشر شده است. کامپیوترها در رفتار انسانی بیشترین مجله را منتشر کردند. دانشگاه ویسکانسین-مدیسون در رتبه بندی کل نشریات قرار دارد (39 = n). تجزیه و تحلیل تجسم نشان داد که روانشناسی شخصیت، روانشناسی تجربی، عوامل خطرساز روانشناختی و روانشناسی تکاملی نگرانیهای مستمر پژوهش بوده است. نتيجه گيري: اين مطالعه به صورت گزارشي از روند جهاني پژوهش در ارتباط با رسانه هاي اجتماعي در فيلد روانشناختي است. بر اساس داده های خام از وب علوم، ویژگی های انتشار مانند کیفیت و کمیت با استفاده از تکنیک های کتابشناختی بیش از 12 سال مورد ارزیابی قرار گرفت. ایالات متحده آمریکا و موسسات آن نقش مهمی در این موضوع ایفا می کنند. ترجیح داده های مربوط به رسانه های اجتماعی در روانشناسی روانشناسی شخصیت، روانشناسی تجربی، عوامل خطر روانشناختی و روانشناسی رشد است.